This marbled blueberry cheesecake is made in the Instant Pot and is topped with blueberry compote. I always blind bake my crust for cheesecakes because I prefer a bit more crunch when eating it. You can completely skip this step if you don’t mind a softer crust for your cheesecake. If you do choose to blind bake the crust, it’s really simple. You just pop it in the oven for 15 minutes and you’ll have a firmer crust. That’s it! This Instant Pot Blueberry Cheesecake is really simple to make! It has a graham cracker crust and a smooth and creamy cheesecake filling. I marbled some blueberry compote into the top of this cheesecake because I absolutely love fruit filling and fruit topping. If you don’t want the marbled cheesecake look, simply skip the step for marbling the cheesecake with a knife. You can use fresh or frozen blueberries for this Instant Pot Blueberry Cheesecake. Just make sure they’re rinsed well and there are no stems when making the compote. Make the compote by adding the blueberries to a pot, add in the sugar, lemon juice, and cornstarch and allow the blueberries to reduce into a sauce. You want to let the compote cool before marbling your cheesecake if you choose to do so. Save the rest of the compote for the next day after the cheesecake has chilled. I always warm the compote up slightly to make it easily spreadable. What if you have an 8 qt. Instant Pot? You can still make this cheesecake with the 7 inch pan or if you would prefer you can make this recipe in an 8-inch pan. The amount of ingredients (for the 7″) will make a slightly shorter cheesecake but it will still taste the same. If you are making the cheesecake in the 8-inch pan, you will have to adjust the time by 5 minutes. Marbled Blueberry Cheesecake made in the Instant Pot and topped with blueberry compote. On the stove top, combine 1 cup of blueberries, 3/4 cup of sugar, 1 tsp of lemon juice, and the 1 tsp of cornstarch into in small pot. Heat on medium and stir well. Turn down the heat and allow the blueberry compote to thicken and then set aside to cool. Combine finely crushed graham crackers, 1/8 tsp salt, and brown sugar. Melt the 4 tbsp of butter and mix in the graham mixture. Line bottom and sides of 7" springform pan with parchment paper. Press graham cracker crust into the bottom of the pan and use the back of a spoon to gently press it up on the sides. Bake the crust in the oven for 15 minutes. Meanwhile, using a food processor, combine the room temperature cream cheese, and heavy cream. Blend using short pulses. Add in the sugar, cornstarch, 2 tsp vanilla, salt, and lemon juice. Quick pulses until just incorporated. Scrape down sides of bowl as necessary. Add in the room temperature eggs and blend using short pulses until just combined. This part is critical! Pour into the parchment paper-lined springform pan and allow the filling to settle. Gently pick up the springform pan and "tap" it onto the counter to pop any air pockets that may be in the filling. Smooth out the top with a spatula. 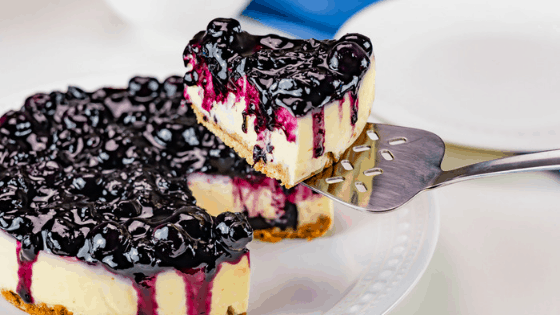 If Marbling the Cheesecake with blueberries (make sure it has cooled) - add a few teaspoons of compote onto the top of the cheesecake and use a knife to swirl it. Loosely cover the top of the pan with aluminum foil. Pour 1 cup of water and the 1 tsp of vanilla into the pot and put the trivet into place. Create a sling out of foil or use an Instant Pot silicone sling and place it in the Instant Pot. Gently place the cheesecake in the Instant Pot and close the lid. Set the pot to MANUAL and cook for 40 minutes. Allow the Instant Pot to Natural Release for 18 minutes before removing the lid. Carefully remove the cheesecake from the Instant Pot and carefully remove the foil (careful not to drop any liquid on the cake.). Use a paper towel to soak up any water that may be laying on the cake. Allow the cheesecake to sit on the counter for 10 minutes before moving the cheesecake to chill in the refrigerator for 24 hours. Once cheesecake is chilled, it is safe to remove the cheesecake from the pan. Top with the remaining blueberry compote.